First things first: The winner of last week’s giveaway (A copy of Mended: Restoring the Hearts of Mothers and Daughters by Blythe Daniel and Helen McIntosh) is…Summer Marrero! Thank you so much to everyone who participated. And now, on to this week’s post. During my formative years, I lived at the end of a long caliche road in Elm Mott, Texas. You blink and you miss this little country town driving up Interstate 35 from Austin to Dallas. My rich friend, Deanna, lived about half way down the road. Her family owned a bigger plot of land, a golf cart, and a trampoline. They lived in the only house with more than one story and the road bore their last name. In my book, Deanna was rich. One Easter Sunday I remember her telling me about the egg hunt they have every year. 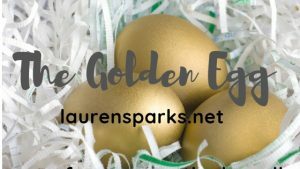 Her parents hid plastic eggs all over their property and all the kids and grandkids kept their eyes peeled for the gold one. All the pretty pastel eggs held candy and fun trinkets. Those were ok. But the gold one – it had $50 inside. The golden egg turned this hunt into a sport. It was the coveted prize. This is what we celebrate on Easter Sunday (and EVERY day). The true “golden egg” of this holiday is this “gift of God”. This “eternal life in Christ Jesus” when we make Him Lord over the whole of ourselves. This freedom – worth immeasurably more than $50 – God offers freely to whoever will believe in it. In Him. You don’t have to search for this prize. Our Heavenly Father holds it out to you with an open hand. If you have questions about how to reach out and take it, I would love to visit with you virtually or in person. Email me confidentially at lauren@laurnsparks.net. I can’t wait to talk to you more about my Savior. And I pray you find rest and refreshment in your “golden egg” this Easter. Sharing is caring! If you liked this post, please share to your favorite social media accounts. And if you want to make sure you don’t miss anything, subscribe! Yeah, that ain’t happening in my house. My 14 year old daughter loves Jesus, and she’s mature enough in her faith to understand that her relationship with God should affect the way she treats me. But oh, the hormones and insecurities and growing pains and emerging wings. At times the sass and disrespect just explodes out of her like a balloon blown up past capacity. Other times I can see the battle waging inside of her as the war continues between us. And I am no innocent in the matter. As much as I love her (it’s so painful at times), her words and tone can prick my pride like nothing else. Anger, confusion and hurt feelings = more hurt feelings – hers. What hills are worth dying on? What can I let go for the sake of harmony and what will lead her into a life of crime and sloth if not dealt with? When should I apologize and when should I insist that she? Being a mom to a daughter is hard. Just last week, I said these words to my beautiful girl, “How are we going to rewrite this story so I’m not always the villain? You know I am FOR you, right?” I know I’m not alone. Every time I bring the subject up with friends or acquaintances (anyone who will listen, really), I receive sympathy, understanding and similar stories in return. 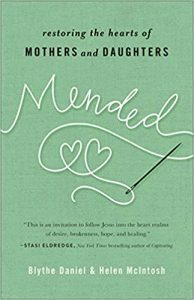 Mended: Restoring the Hearts of Mothers and Daughters by Blythe Daniel and Helen McIntosh has put me on the path of rewriting the story. Written by a mother/daughter duo, they draw from their own personal anecdotes and Helen’s doctorate of Education in Counseling Psychology to provide a resource that is both relatable and helpful. While praying to “ask Him for clarity and guidance on what [I] need to do to break away from and begin a new path…” I’ve realized that my normal parenting style – that of lecturer – may not work well at this stage in my girl’s life. I view every infraction as an opportunity for a lesson. And while that may be true, teenagers hear lectures about as well as we hear the teacher in episodes of Charlie Brown. With 14 years of instruction already behind us, leading by example may be the better route. Especially in the areas of love, respect and forgiveness. The authors point out that “Forgiveness isn’t just an act we walk through; it’s a way of life we choose.” My takeaway? Apologize and ask forgiveness often. The tutorial is in the living illustration. I’m working to “Let down defenses and pick up unconditional acceptance.” After all, my daughter is pretty amazing. She plays volleyball, makes A’s, loves Jesus and loves to tell others about Him. She can sing, act, and is a fiercely loyal friend. She feels things deeply and gives her Mama all the feels. And even if she wasn’t all those things, I would still be so proud to call her mine. She is one of God’s great gifts and I’m so grateful to have a front row seat to see all the ways He will use her. The authors and Harvest House Publishers generously provided me with a copy of this book for review and they extended their generosity to you! I have one extra copy of this book to giveaway to a lucky reader. If you are not a current subscriber to my blog (I rarely email more than once a week with the new post), click subscribe and sign up. That’s all you have to do to enter. If you already subscribe (thank you! ), leave a comment on this post. I will select one reader from comments and new subscribers randomly on 4/18 and mail the book to you! I also want to remind you that links in this post are affiliate links and should you choose to purchase this book (or anything else) once you’ve clicked my link I will receive a small commission at no extra cost to you to help offset the costs of this website. Thank you in advance!